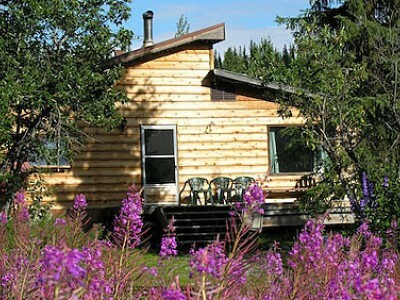 Located on over six spacious acres, across the road from the Paxson Wildlife Reserve, Denali Highway Cabins is the only private property on the headwaters of the National Wild and Scenic Gulkana River. 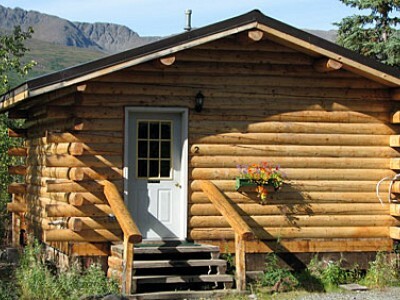 Our cabins and tents are secluded from the road and scattered about the property for optimal privacy, and all share fantastic views of Paxson Mountain as it towers over the Paxson region. 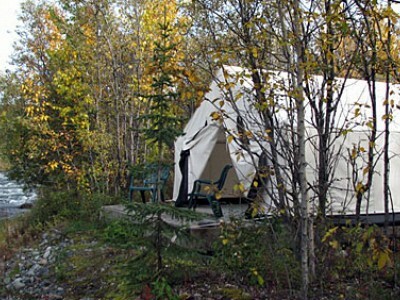 Our cabins are located as close to the Gulkana River as our septic systems and winter ice/thaw cycles permit. Guests will never be bothered by road noise, bar noise, generator noise, guy-next-door snoring noise, dogsled kennel noise - only the wonderful sound of the river. Best for: those who wish to experience log cabin living; who enjoy comfort & luxury and don’t want to “rough it.” Cabins have either one or two beds in them. Best for: adventurous travelers who wish to try something different; guests who want to experience “glamping” (glamorous camping). Best for: families or two couples who wish a longer stay in Paxson, with full cooking facilities. ELECTRICITY & PLUMBING. Other than the tent-cabins (see full description), every unit has full electrical outlets and full plumbing with on-demand water heaters. Why do we even mention this? Many remote Alaskan properties do not offer these in cabins. If the words plumbing and electricity are not mentioned on the website, it most likely is a “dry” cabin with an outhouse, often with only a kerosene lamp. Genuine Hudson Bay blankets for warmth and pure North Country appeal – What is a Hudson Bay blanket? Television. This is by design…we believe no tv is an amenity! Individual microwaves and frigs in cabins. Available in the Great Room only. Irons and ironing boards. The amount of electricity these consume are not commensurate with a solar electric system. Please see our Sustainability page. Hair dryers. Again, an electricity hog. We kindly ask guests to refrain from their use if bringing their own. "I loved Paxson and could easily have stayed two or three days there."